Are you a hands-on person? Do you enjoy working on projects? Do you like math? If you answered yes to all of these questions, you might consider pursuing a degree in Construction Trades. Construction trade is an umbrella term that covers a wide variety of hands-on, service-based jobs. These jobs include plumber, electrician, painter, roofer, as well as carpenter. There are many other job titles included in the construction trades, and they all share one thing in common: hands-on work. If you are interested in a degree in construction, you must enjoy working with your hands. 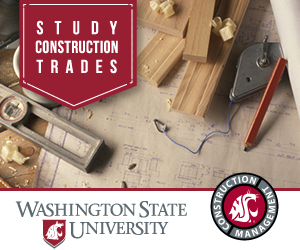 Studying construction will require that you take courses in a wide range of subjects. The most important subjects you will need to study include math, safety procedures, mechanical drawing, and woodworking. Students are challenged to understand construction as a process and to develop management skills based on systematic, logical analysis of available resources and imposed constraints. Most of your course load will be taken out of the books and put into real work application. One of the best ways to receive real work experience is through apprenticeships. In the construction trade, apprenticeships are very common, often even required by most programs. As a construction student, you’ll learn about trade materials, surveying, cost estimating, project coordination, blueprint reading, and technology utilized in the management of construction operations. You’ll take courses such as communications, accounting, marketing, and quality control, in addition to real-world experience through internships, apprenticeships, or field work. Construction programs may be offered at the associate's, bachelor's, master's, or doctoral levels. When looking for the right school to study construction, it’s important to know what type of degree you want to pursue. For example, Arizona State University offers BS, MS, and Ph.D. degrees in construction management. However, not all universities will offer this program at each level, it’s something you will need to research while searching for a school to attend. In the world of construction plans can often change due to weather, scheduling, and availability of resources. In order to be successful in a construction trade, you must be flexible. This means that you must be able to change locations, hours of work in a day, and jobs when asked. 2. Do you enjoy variety in your day? Professionals that work in construction trades need to enjoy variety. In construction, your day to day routine will vary frequently. You will run into many different problems and challenges, each of which will require creative thinking in order to solve. 3. Where can you pursue a career in construction trade? Careers in construction can be found throughout the United States, as well as the world in general. Some jobs might require workers to travel, while others have a permanent location. Residential construction or road construction jobs will require workers to travel around a state or country. The availability of these jobs depends heavily on the public demand. High public demand in an area will mean more jobs for construction trade. 4. Do you enjoy helping others? Construction trade is a service industry. Ways in which you could be helping fellow humans include creating roads to drive on, fixing a leak in someone’s home, and building a house. If you are looking for a rewarding career, construction trades might just be the path for you. Learn more about studying construction trades in the USA by reading our growing article collection. « Study Guide by Subject	« Study Construction Trades in the U.S.